Perhaps it was Lynn Seymour's first entrance on roller skates, or perhaps it was back-flip that did it, but Kenneth MacMillan's ballet Anastasia has always held a special place in my heart. 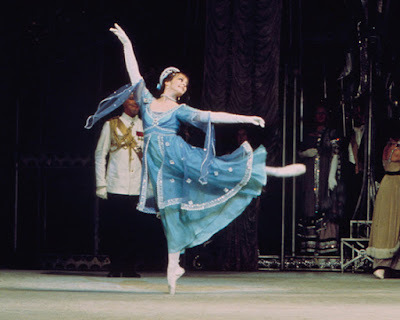 It wasn't the first MacMillan ballet I had seen, we saw Romeo and Juliet (with Natalia Makarova), but seeing Anastasia with Lynn Seymour in 1975 made a really big impression. This is partly because after 1978 the full three-act ballet passed out of the Royal Ballet repertoire so I never got chance to see it again until 1996 when Deborah MacMillan supervised a new production (with Viviana Durante). Now this has been revived and we caught the performance given by the Royal Ballet at Covent Garden on 28 October 2016 with Lauren Cuthbertson in the title role and Sarah Lamb as Mathilde Kschessinskaya, conducted by Simon Hewitt, with Viviana Durante and Jonathan Cope credited with the principal coaching. Anastasia was MacMillan's first three act ballet using a new story (it was preceded by Romeo and Juliet and versions of Sleeping Beauty and Swan Lake). Its strength and weakness is that MacMillan uses Tchaikovsky symphonies (nos. 1 and 3) for the first two acts, this means that MacMillan has the advantage of a coherent score which really works in musical terms, but which limits the manoeuvrability when it comes to the dramaturgy. His later ballets in this vein, Manon and Mayerling used scores assembled and arranged (from Massenet by Leighton Lewis for Manon and from Liszt by John Lanchberry for Mayerling) so that though the score lacks the real coherence and music-drama of a specially composed entity, the shape of it can be made to fit the necessity of the drama. It is a shame that MacMillan's only commissioned score in this vein was from Richard Rodney Bennett for Isadora, which mixed dance and speech and which has never found an entirely satisfactory form. MacMillan's final full length ballet, The Prince of the Pagodas showed what he could do with a fine commissioned score, even against the intransigence of the Britten Estate in not allowing him to cut the score (something which changed on revivals after his death). So the first two acts of Anastasia are fluently attractive, with a wide variety of imaginative choreography designed to show off the whole company, including a role for a young boy as the Tsarevitch (we saw the immensely talented Rory Toms). But the two acts have a Petipa-like ability to stretch a little plot across a great deal of dancing, but much of it is beautifully done. It simply lacks a sense of the inner drama which MacMillan brings to Mayerling and Manon, and the character of Anastasia does not really get chance to develop under testing circumstances. It is only in the striking last act (originally a free-standing ballet) that the drama springs to life. Lauren Cuthbertson made an astonishing Anna Anderson in this act, having been a striking Anastasia in the previous two. She was finely supported by a large cast, including Eric Underwood as a lowring Rasputin (in the first two acts he is woefully underused). Though I have to admit that some of the detail in the ensembles was rather ragged and not as crisp as I would have liked. And the back flip wasn't as tidy as it could have been; there is probably a technical term for the move but essentially Anastasia leaps up and ends up held horizontally by three hunky sailors and she is then promptly thrown over their heads to be caught (hopefully still horizontal) by three taller hunker sailors. It was nice to a new face (to me) in the pit, Simon Hewett is Principal Conductor of the Stuttgart Opera, and Principal Conductor of the Hamburg Ballet. The Royal Opera House was pretty full, and at a time when organisations worry about getting young people into the theatre it was good to see so many younger faces in the audience. Whilst many of them would probably never go to a concert involving two Tchaikovsky symphonies and a Martinu symphony, they happily listened to the music because they were not really there to listen but to watch. An unofficial survey conducted by Co-Opera Co. suggested that the majority of people who enjoy attending opera in later life, have at some time been involved in performing at some level, which shows that exposure to and participation in opera as a matter of course is an important part of the education process. Something which the audience at Anastasia would probably confirm, as I would bet that the majority of the young women had taken part in ballet or dance classes when younger.